Casting a circle protects you from any outside influences from other planes. There are a lot of formal ways to begin a circle and some informal. I won't be telling you HOW to cast a circle but I will link and refer to some of my favorite ways to cast a circle below. 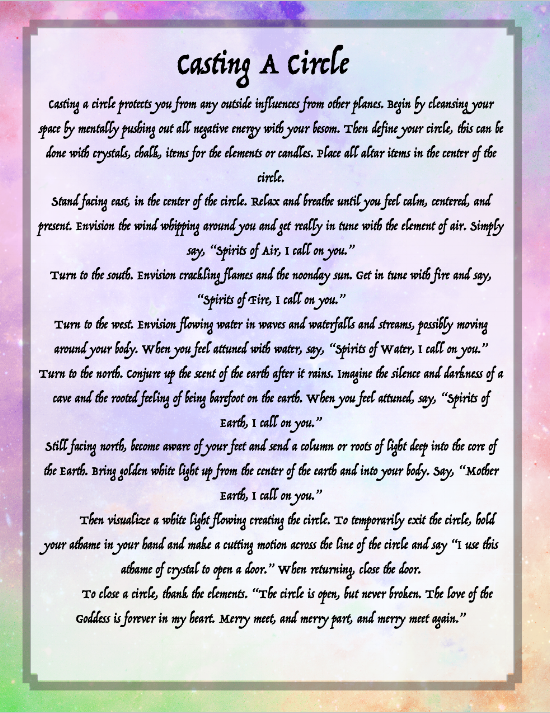 This image is from my personal Book of Shadows. Always begin by cleansing your space by mentally pushing out all negative energy with your besom. Then define your circle, this can be done many ways. Then visualize a white light flowing creating the circle. To temporarily exit the circle, hold your athame in your hand and make a cutting motion across the line of the circle and say “I use this athame of crystal to open a door.” When returning, close the door. Whitehurst, Tess. 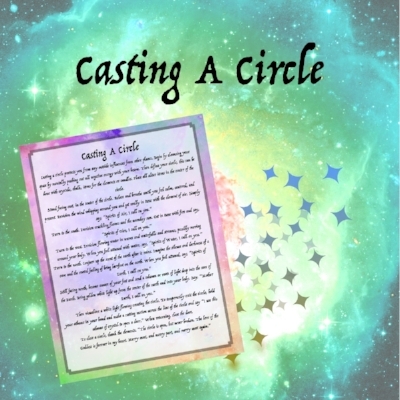 “How to Cast a Magical Circle in 6 Simple Steps.” Tess Whitehurst, 27 Nov. 2017, tesswhitehurst.com/how-and-why-to-cast-a-magical-circle-6-simple-steps/. Wigington, Patti. "How to Cast a Circle for a Pagan Ritual." ThoughtCo, May. 27, 2017, thoughtco.com/how-to-cast-a-circle-2562859.